Most of the snow melted over this last week and my daughter actually got to wear a jacket on two different days. I thought we just might get to put away our snow boots for the season. It ended up being wishful thinking though. We got quite a bit of snow over the weekend. And because of the snow I thought it would be fun to make snowmen. 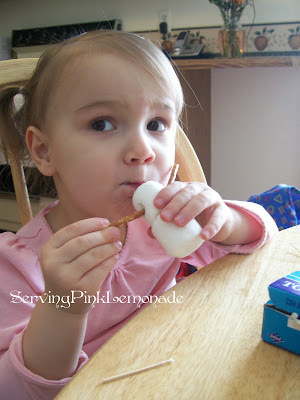 You can use a pretzel or toothpick to put down the center of the snowman to hold it together. I poured chocolate syrup in a bowl and used a toothpick to draw on the face. William will love this... I need to get some big marshmellows. I have to be honest, I have no idea if I know you. I got an email from Memory Aviles who got an email from a "Sister Fisher", who got an email from your mom :0). I am originally from the Corona Stake but now live in Camarillo. I totally love your blog and was wondering if I could send the link to some of my friends so they can check it out. I would also like to put a link from my blog to yours. My son is still really young but I use to teach Kindergarten and will someday teach preschool and I would love to use your ideas. Please post on my blog to let me know if it is ok to send your blog address to my friends. And to let me know if I know you. 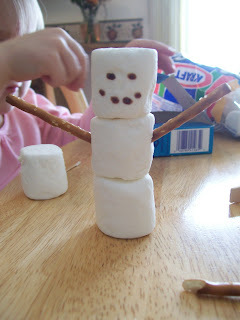 I love this marshmallow idea too! I am going to the store tomorrow to buy the big marshmallows...we only have the little ones. My daughter is going to love it. We have more rain here right now, and this will be great. Thanks! That's such a cute idea! Hey, check out my blog... I posted some matching games I made, thanks to your awesome idea! I love how they turned out and am excited to have Kayla play with them.